Although the wintry weather accounted for most Fylde coast hockey fixtures over the weekend, three Lytham St Annes Hockey Club teams managed to play. These included the top of the table clash between Lytham Ladies and Lancaster in North Division Two. The Lancaster side won 2-0, a result which sealed the title. Lytham made some early breaks but the unbeaten hosts showed why they have conceded only seven goals in 19 games this season. Lancaster broke with great skill and movement to open up a two-goal lead, also firing a penalty stroke wide. Promising young players, like Grace and Tasha Webster, began to show their skills and the visitors played their best hockey in the final quarter, a testament to their fitness and team spirit. However, they were frustrated at not converting three penalty corners. Lancaster ran out deserved winners and are now 10 points clear of Lytham, who have only two games to play. Saturday’s final home game is against mid-table Garstang at AKS. Lytham 2 played out a goalless draw with their Preston counterparts at Ansdell Arena in Lancashire Central division one. Lytham restricted the visitors to very few shots in the first half, while creating chances of their own through excellent passing. However, they could not score from four short corners. Preston had their best spell after half-time but keeper Maisie Rogers was determined not to concede. Lytham dominated the final 20 minutes, forcing nine short corners, but they had settle for a disappointing 0-0. Lytham Men’s 2 lost to the only goal against Lancaster and Morecambe 2 in North West division five north north. Lytham maintained their positive attitude against the fourth-placed side in a game switched to Ansdell because the Lancaster pitch was frozen. Lytham pressed their opponents well and most of the action for concentrated in midfield for most of the match. Lancaster won the match with a first-half strike but couldn’t force a single short corner, while Lytham failed to convert six. Lytham remain seventh and must beat Fylde 2 in their final home game this weekend to have any chance of climbing higher. Although Blackpool Hockey Club’s senior men’s side were without a fixture over the weekend, the Seconds were one of the few teams able to stage a match in the North West League. Hopes were high of a first win of the season in this battle of division four north’s bottom two but it was Bolton Seconds who left Stanley Park with a 7-4 win which lifted them above West Derby 2. Against a Bolton side captained by former Blackpool player Phil Taylor, the hosts started with an attacking 3-4-3 formation for the first time. This backfired as Bolton scored four goals in the first 20 minutes, with Blackpool’s defence being outnumbered and Bolton finishing clinically. Two goals from Dave Morgan gave Blackpool hope, the second a spectacular effort from above his head which bounced into the goal. Will Pickles added another on the stroke of half-time and Bolton looked severely rattled at 4-3. Blackpool searched for an equaliser as Morgan, Jay Currey and Keiffer Earnshaw worked well together up front but it was Bolton who regained control with two further goals. Morgan fed Earnshaw, who fired under the keeper to make it 6-4, but Bolton sealed the win with their seventh goal, leaving Blackpool with just three games to add to their one league point of the season. Lancashire Central division one leaders Rossall Ladies saw their advantage cut to three points by Fylde 2, who brushed aside Leyland and Chorley 2 7-1. 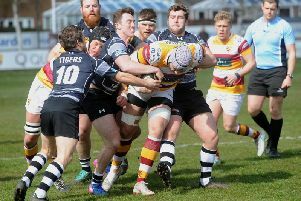 Rossall, whose game at third-placed Clitheroe and Blackburn Northern 2 was postponed, have a game in hand and three to play going into Saturday’s home clash with second-bottom Brookfields.